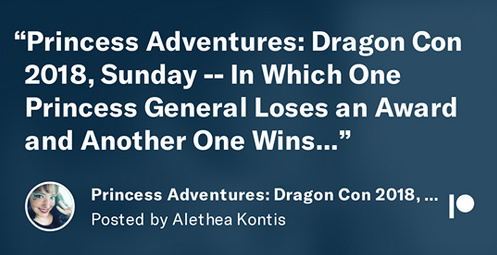 A new episode in The Princess Adventures has been posted — READ IT HERE. So much happened on the Sunday of Dragon Con that I had to break it into two parts. This is Part One: The Dragon Awards. By the time I’ve finished chronicling this year’s Dragon Con, I will have written around 10,000 words. But you know what? I’M GLAD. I’m glad because I am able to process and chronicle this year’s amazing convention and all the magical things that happened to me. Magical things happen every year, but until now I have never had the time (or made the time) to tackle this assignment and see it all the way to the end. I always give myself some sort of ridiculous arbitrary time limit, but my Dragon Con Report was never going to be done the week after Dragon–I should have never expected it to be. Nor should I put such pressure on myself in the future. Because now that it’s almost done, I feel…whole again. Well, almost whole. I’ve released these Princess Adventures to all my Patrons at the $1 Level and up. I do this because it is my main source of income. Funding these adventures has to come from somewhere!